The "Bid Sheets" menu bar link is on the top menu bar between "Sales" and "Reports". This bid sheet page is like a single-page-per-item view of the auction catalog that is designed to be printable. Use the page number links and/or the arrow links to move from one item to the next. The search/sort works pretty much the same way it does on the catalog screen. The format of the sheets look slightly different based on whether the item is Fixed Price, Live, Dinner*, or anything else. See the Internal Codes section for an optional bid sheet format you can assign to one category via the PREPRINT_BID_CATEGORY setting. The edit category page (any category) will show at the bottom of the page what category(s) you have configured, and if any, what 'bid increment rule' will be used - in other words, what pattern of increases from min bid upwards will be used for the pre-printed bid amounts. Also, you'll see items with the multiple-qty checkbox appear on separate pages as A,B,C...etc. When you are ready to print, you don't need to do them one-at-a time - you can check the "Single (large) printable report" checkbox, and it will load all pages together. This works in conjunction with the search, so what I usually do is search for each category in turn and that way I can print on different colored paper by category. Another option is to show _ Pre Auction bids. This pre-fills the bid sheets with advance bidders, if any. New! You can now check a new option to show images on the bid sheets. It prints a few less blank lines for bids when an item has an image. You can print to a black and white or color printer as you prefer. You can have fewer wasted blank pages if you use some print dialog features (Chrome works particularly well) to use minimum margin size and no headers/footers so that all available space on the page is used. 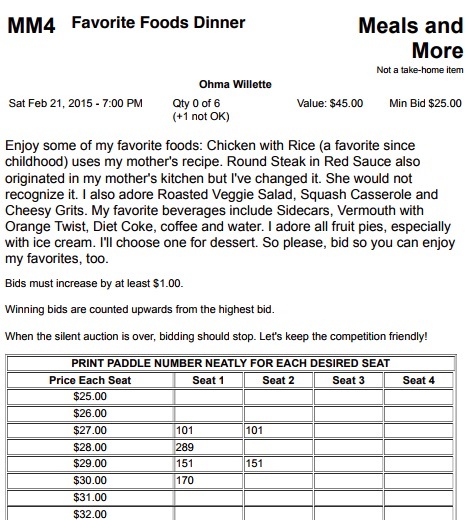 Note: Like the printed auction catalog, bid sheets could alternatively be prepared 'manually' using various mail merge templates and the spreadsheet download feature. We tried this one year, and while it gave better control over formatting, it is a multi-step process that is not easy to do quickly for last minute new item bid sheets... so I recommend instead using the built-in bid sheet report. Also, note that the category setup page will tell you how many items have been entered for each category - you can use this to decide which colors to use for bid sheets so that you make best use of a ream of multi-color paper. But if you give me a similar looking chart with more or less adjustment points but following this same idea, I can put that in for your system. The number of steps can be more or fewer - $1 always is the simplest rule, or you can make a very long list of increments and associated increment amounts. There is a length limit, but it is quite high. Note: The example bid sheet above was done before this rule went into effect - so where it shows $1 increase you should instead see $2 according to the above chart. See the Categories page for more info on this feature - you can now have different messages appear on your bid sheets depending on the category. 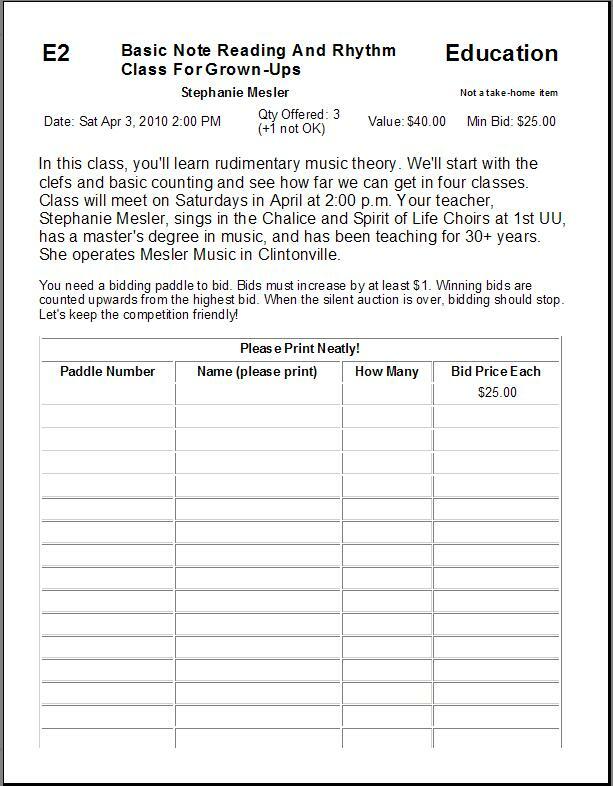 Also, bid sheets with only Qty=1 will not have the "How Many" column appear.